More and more companies are introducing robots into their systems to try to tackle and improve their manufacturing processes. In the last few years, industrial robots have taken over many of the applications in factory settings all over the world. In the coming years, more industries will increase the number of robots in their settings to widen up the production of their processes. 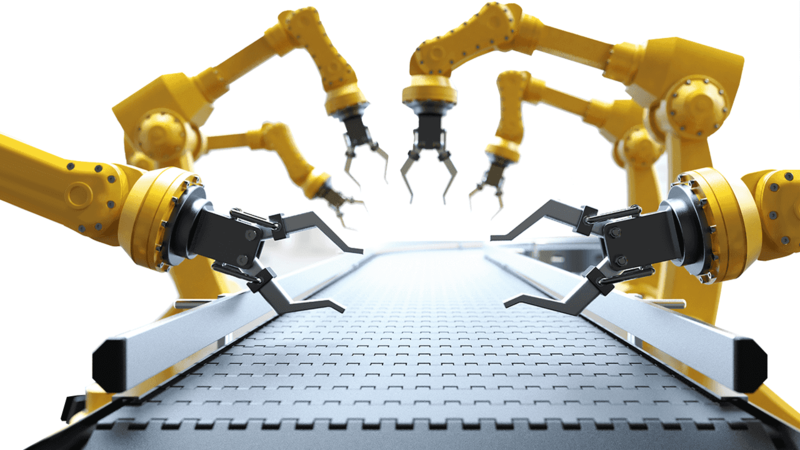 With this revolution, we look at the current robot trends in the manufacturing sector. The use of collaborative robots is quickly catching up in many industries. Collaborative robots or cobots are industrial robots, capable of working alongside humans with the least interference, they are also cheaper than the older generation robots and they can carry out all kinds of tasks. One of the leading manufacturers of cobots is Universal Robots, and many companies like Tegla Medical and many automotive industries have benefitted widely from the use of cobots manufactured by Universal Robots. Cobots are faster, more dependable and safe. One of their greatest aspect ids flexibility and they can take on both heavy and light duties and they do not occupy too much space. They come with sensors that allow them to move freely among people, avoid accidents at the work place and give way to the human workers. Cybersecurity is always a problem that befalls many industries and businesses. The risks also increase as more robots are connected the company’s internal securities for the collection of data. Because of this, robot manufacturers are adding more security measures to the robots to counter attack cybersecurity. This addition includes adding in more intelligent sensors and software that can analyse information in real time. Manufacturers are also adding and implementing better controls to protect the robots themselves. The defensive measure the manufacturers are taking are ensuring that they build enough firewalls configuring all the networks and filling up any air gaps and logs that cyber attackers may target. To keep the risks more at bay, the manufacturers urge the users to change all the default settings in order to secure all the devices. The settings include passwords and user names. With all these measure in place, attackers will find it harder to manipulate the robots to access whatever information they need. The use of service robots especially in the retail sector has seen tremendous growth in the last few years. If this trend is anything to go by, then we expect more service robots to take over many of the activities in a good number of many other retail stores around the world. Retailers are no longer looking at robots as just helping hands. Robots are improving productivity and the efficiency of the industry. They are also improving the flexibility and scalability of all the operations in many retail stores. Some of the companies that are trending with the use of robotic services are Wal-Mart, amazon DHL, CIG, Uber, Tesla, Target, Lowe’s, Adidas and Nestle among many others. Some people are even afraid that at the pace many of these companies are using the robot service, most likely the human role will dwindle in the next 30 years. For now, the human workers are still working alongside the robots and taking on other jobs that the robots cannot do. The number of companies using drones today is much higher than it was a few years ago. There is an expectation of the number of drones to increase in the next few years. Drones come in handy in the manufacturing sector; industries use them to transport raw materials and finished products from one place to another. They also monitor processes like production lines, Quality assessment and take inventories. They help to free up the human staff so they can take up other useful roles. By getting rid of the monotony of work in the workplace, they allow the human staff to get motivated to work for the betterment of the company. Although there is likelihood that the current trends of the industrial robots may affect some of the jobs in the market, not all is lost yet. Robots still need to work with humans to drive forward the productivity as they take on the hard jobs while the humans handle jobs that require emotions. If used morally and correctly, the robot trends have a lot to offer the manufacturing industries now and in the future.